A soft lustrous plant fibre.Biodegradable cellulose fibre has been infused with natural mint powder extracted frrom the peppermint plant, that give the fiber natural antibacterial and cooling properties. 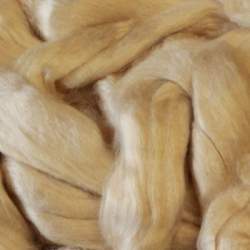 This fibre will not felt on its own but can be incorporated into your felt making where the wool will hold it on creating interest and shine. It's beautiful to spin and can be blended with wool or other plant / silk fibres.